NISHINOMIYA, Hyogo (Jiji Press)--Osaka Toin won the 94th National High School Baseball Championship at Hanshin Koshien Stadium on Thursday, again smashing the ambitions of Aomori Prefecture's Kosei Gakuin to win a national title. Beating Kosei Gakuin 3-0 at the Koshien final, Osaka Toin became the seventh school on record to win both the spring and summer national high school baseball titles in a single year, following in the steps of Okinawa Prefecture's Konan, which achieved the feat in 2010. This is the third summer tournament title for the Osaka Prefecture team. Osaka Toin last won the championship in 2008. 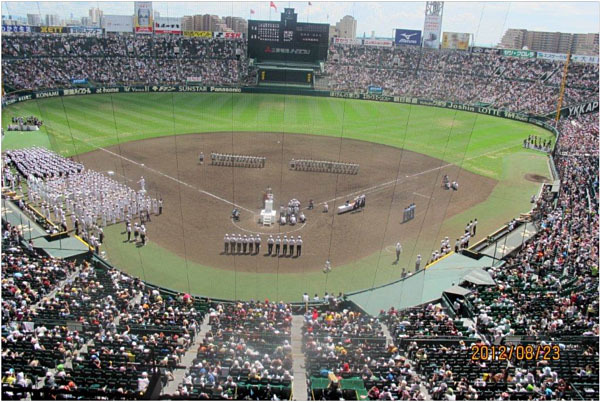 The game, which attracted some 46,000 spectators at the western Japan city stadium, was the first-ever rematch of April's National Invitational High School Baseball Tournament final, in which Osaka Toin defeated Kosei Gakuin 7-3. Kosei Gakuin reached the final for the third straight time since the 2011 summer tournament, but was beaten in all three finals to finish as the runner-up. It was the 10th time that a team from the Tohoku northeastern region has reached the final of either the spring or summer tournament, but none has been able to clinch victory. Osaka Toin starter Shintaro Fujinami pitched a complete-game shutout, as he did in the semifinal against Meitoku Gijuku of Kochi Prefecture, allowing Kosei Gakuin only two hits in the final. He struck out 14 batters and threw straight balls at speeds of over 150 kilometers per hour. Center fielder Kenta Hakusui scored the first run for Osaka Toin in the fourth inning by hitting a solo homer. In the fifth, the team added two runs after a bunt by third baseman Yuya Kasamatsu led to an error by a Kosei Gakuin fielder. "Fujinami performed his best pitching in his three years with the team," Koichi Nishitani, manager of Osaka Toin, told reporters. "I'm happy with the great achievement of winning both the spring and summer tournament titles," Fujinami said.